Ballincollig are through to the last eight of the Murphy’s Stout St Michael’s Cup following Sunday’s well deserved 3-2 away win over Ballyvolane. The visitors, after a slow start, took over the game in the middle part. 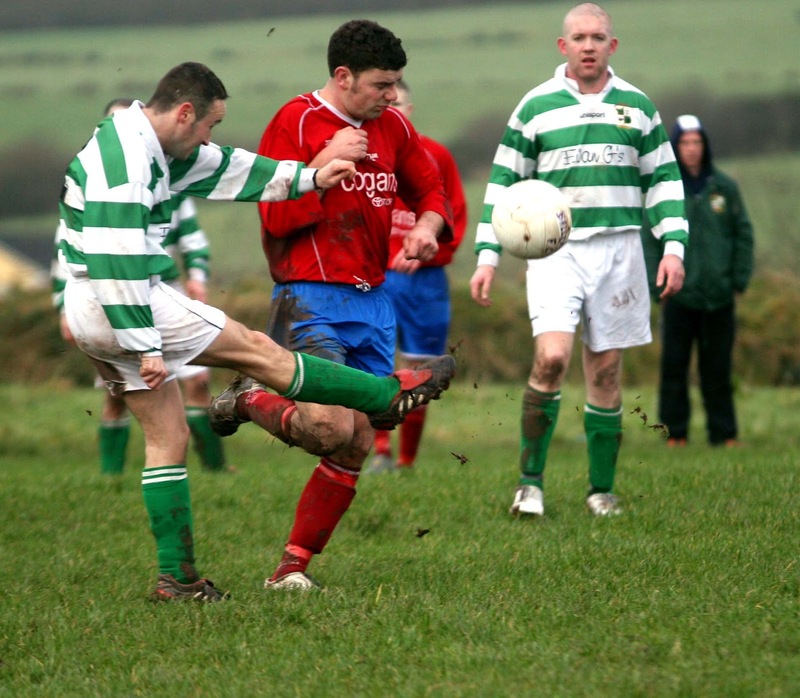 They scored just before and just after it and a deflected free kick, the necessary bit of luck, made it 3-0 before a late Ballyvolane revival yielded two goals. The visitors did have an anxious closing five minutes or so but had done enough. They owe much to the excellence of their midfield. Tom O'Leary, who opened the scoring with a gem, was one to catch the eye and so too did Stephen Nolan but the nod for man of the match goes to Mark Buckley who bossed the sector with tremendous industry and a great deal of class. Ballyvolane will be disappointed. They enjoyed a slight advantage in possession throughout the first half and the visitors gave away at least a half dozen free kicks, most in promising positions but all wasted by the home team. Ballincollig, who had beaten the same opposition on penalties in an early season FAI Cup tie, created a great chance themselves in the 34th minute. Tom O'Leary got in a terrific cross from the left and the hard working David O’Callaghan raced in behind the defence but his close range diving header was very well saved by the home keeper. Hurley though was well beaten in the 44th minute. A fine cross by Stephen Nolan found O'Leary unmarked and about 30 yards from goal. O’Leary sized up the situation, picked his spot and delivered a gem which flew high past the keeper and into the roof of the net. The visitors doubled their advantage in the opening minute of the second half. 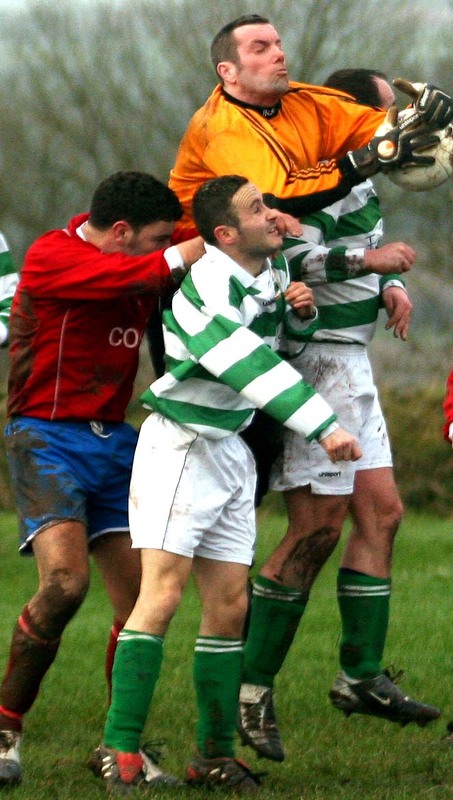 Thomas Galvin chased after a long ball and clashed with keeper Hurley and defender Ellis. Referee Tony Murphy pointed to the spot and Bryan “Biscuits” McNulty calmly converted the penalty to make it 2-0 to Ballincollig. In the 52nd minute, the home side had a decent chance but striker Peter Nugent couldn’t quite get in position as a tempting Martin Cronin cross came in and his header was a few feet off target. 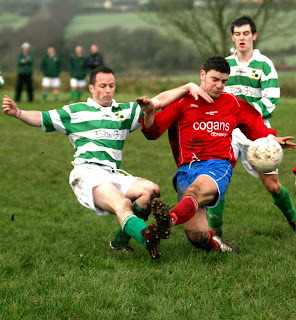 Ballyvolane then brought on player-manager Derek Mellerick but the next chance fell to Ballincollig. 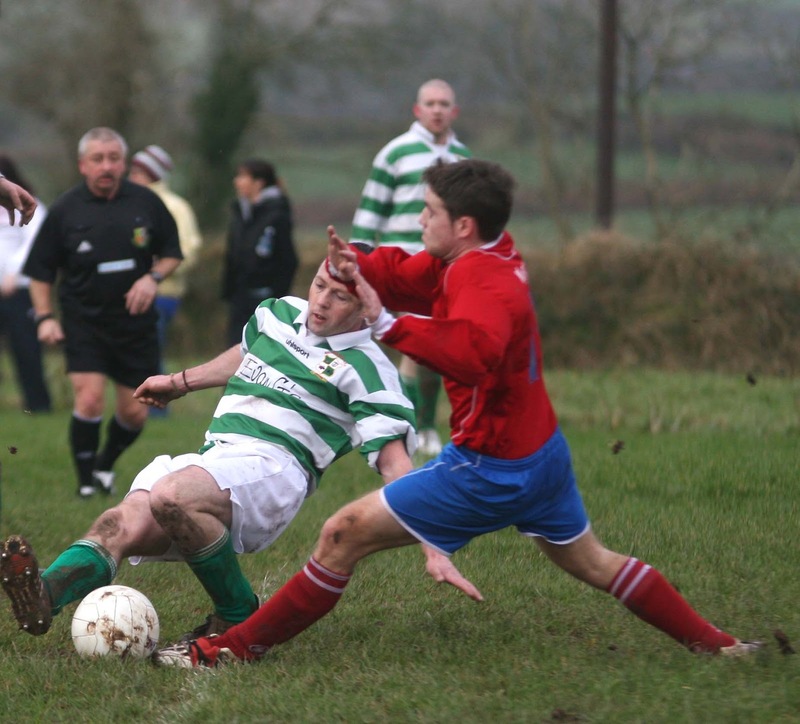 In the 56th minute, they broke away after a Ballyvolane attack. Galvin and McNulty linked and got Nolan in but his low drive hit the side netting. The visitors had better luck in the 61st minute when O'Mahony’s 23-yard free hit the wall. The deflection wrong-footed the keeper and Ballincollig were three up. The home side pulled one back four minutes later when Cronin got onto a long ball in and flicked it past keeper Kelleher who should probably have stopped it. Kelleher did better in the 76th minute when he tipped over a speeding Mellerick free. 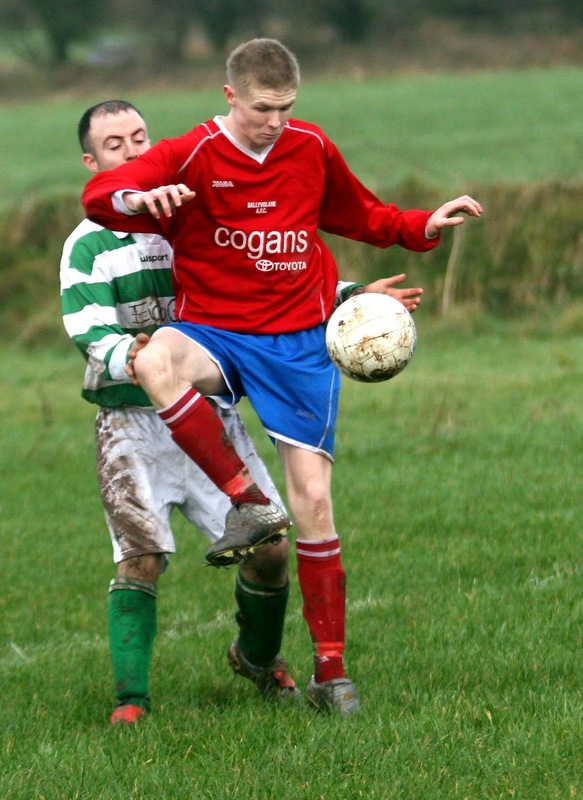 The losers got another goal back in the 85th minute, a 30-yard top corner rocket by sub Kevin O’Keeffe. Three minutes later, they had penalty claims, after Leonard Long seemed to push Stephen Byrne, turned down. Then Byrne headed over the bar from Nugent’s 89th minute corner. 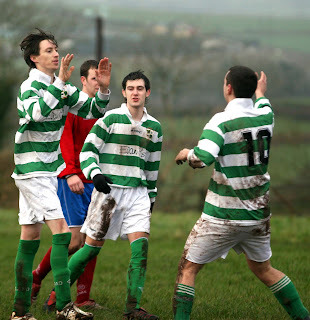 Nugent himself had an injury time free come back off the Ballincollig wall and soon afterwards the visitors were celebrating. Ballyvolane: Shane Hurley, Stephen Byrne, Dave Keohane, Don Ellis, Paul O’Callaghan, John O’Driscoll, Martin Cronin, Niall Guiton, Dave Swan, Peter Nugent and Brendan Nyhan. Subs used: Derek Mellerick for Swan (54th minute) and Kevin O’Keeffe for Keohane (78th). Ballincollig: John Kelleher, Jason O'Leary, Trevor O’Mahony, Leonard Long, Mark Buckley, Tom O’Leary, Conor Radley, David O’Callaghan, Stephen Nolan, Thomas Galvin and Bryan McNulty. Subs used: Cathal O’Callaghan and Gavin O’Callaghan for Galvin and McNulty (both 69th minute) and Colin Barrett for Nolan (78th).